Should I Go With the Latest Jewelry Designs, or Stick with the Classics? This is a question that prospective brides and bridegrooms often ponder. Trend- setting women who love to be on the cutting edge of fashion in their clothes, shoes, and accessories often desire the very latest designs in jewelry as well. 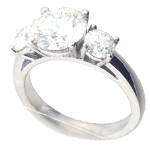 For example, a very popular trend for engagement rings is the halo setting. A halo, just like it sounds, is a surround of diamonds around a center stone, and can be fashioned around any shape or size gemstone. Halo settings are favored by many women because the extra sparkle makes the center stone look significantly larger and can add either a vintage or modern feel to the ring, depending on the size of the halo diamonds and the way they are set. It should be noted, however, that many halo designs are very ornate and therefore pose challenges in choosing a wedding band that is both complementary and comfortable. But there are ways to accommodate these design challenges, such as tapering or raising the halo, or crafting a band to contour around the intricate design of the halo. 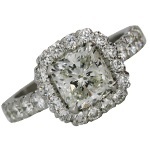 You may also want to consider some classic engagement ring styles that have stood the test of time. 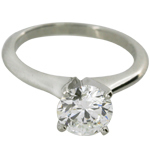 The most popular is the four or six prong solitaire setting, which will arguably never go out of fashion. Another timeless style is the 3-stone design, which features a center diamond or gemstone that is usually larger and set slightly higher than the stones on either side. Both of these designs have clean, simple lines that offer the most versatility in choosing a complementary wedding band. They look equally elegant paired with a simple band in the same precious metal, or with a pavé, channel-set, or shared prong band of diamonds or even colored gemstones.